Researchers have uncovered the tiniest dinosaur skeleton you’ve (probably) ever seen. The newborn fossil (that really tiny thing in the corner) next to a fully formed Tylosaurus skull (measuring 1.2m in length). The fossilized skeleton belongs to a Tylosaurus mosasaur, a leviathan that prowled ancient seas in search of something to eat — which was basically anything smaller than itself. This tylosaur, however, stands out: it’s unusually tiny. While undeniably adorable, this trait also gave researchers trying to identify the fossil a run for their money. 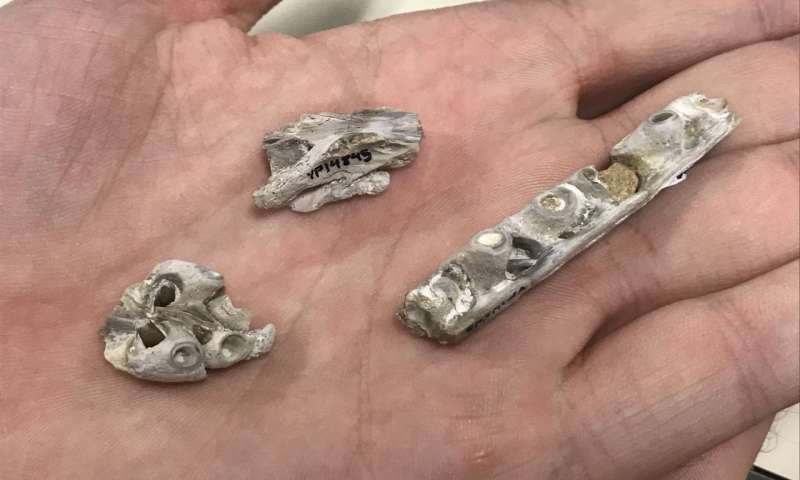 “Having looked at the specimen in 2004 for the first time myself, it too took me nearly 10 years to think out of that box and realize what it really was — a baby Tylosaurus yet to develop such a snout,” recalls Takuya Konishi, the paper’s lead author and a Professor at the Department of Biological Sciences of the University of Cincinnati. Not only is this the ittsy-bittsy-est Tylosaur fossil ever found, but — further compounding the team’s hardships in identifying it — it also lacks a key feature of the species. Although likely the skeleton of a newborn Tylosaurus, the fossil doesn’t have the distinctive long snout that’s a hallmark of the species. This feature is actually so central to the Tylosaurus that it gave them their name: the word roughly translates to “protuberance-lizard”. The snout’s absence thwarted initial efforts to identify which group of mesosaurs it belonged to. Konishi himself wrongly believed it to be a newborn Platecarpus (a related family of smaller mesosaurs). It took comprehensive and exhaustive comparison efforts with closely-related species (such as T. nepaeolicus and T. proriger) to rule out all other options and establish it as a young Tylosaurus, Konishi explains. Tylosaurus are one of the largest-known groups of mosasaurs and routinely grew up to 13m (42.6 feet) long, the front 1.8 m (3.2 feet) of that being its head. The specimen was discovered by Michael J. Everhart, a special curator of paleontology at the Sternberg Museum of Natural History, Hays, Kansas, in 1991 in the lower Santonian portion of the Niobrara Chalk, Kansas. The specimens are currently housed at the museum. “As individual development and evolutionary history are generally linked, the new revelation hints at the possibility that Tylosaurus adults from much older rock units may have been similarly short-snouted, something we can test with future discoveries,” he adds. The fossil includes a portion of the snout (including teeth and their roots), part of the animal’s braincase, and part of the upper jaw with tooth bases. Judging from the size of these elements, the animal likely stretched to about 30cm (1 foot) in length. That would make it about 1/6 the size of an adult. Image credits Credit: Ms. Christina Byrd / Sternberg Museum of Natural History, Hays, Kansas. 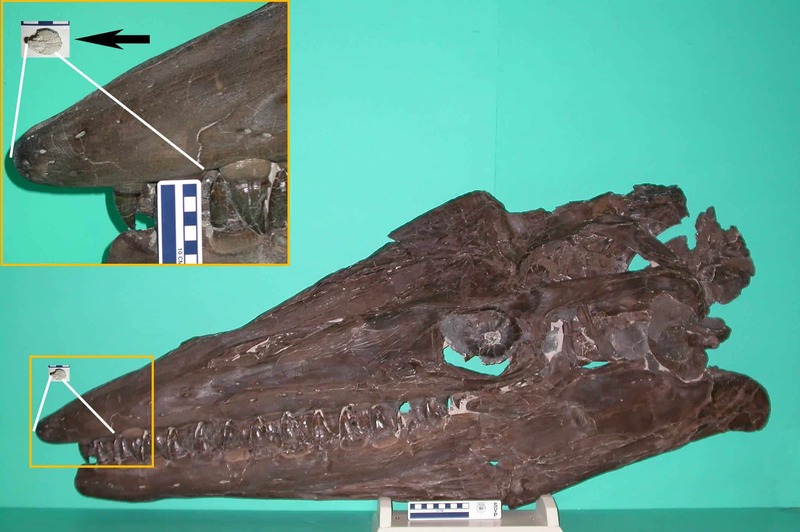 The paper “The Smallest-Known Neonate Individual of Tylosaurus (Mosasauridae, Tylosaurinae) Sheds New Light on the Tylosaurine Rostrum and Heterochrony” has been published in the Journal of Vertebrate Paleontology.